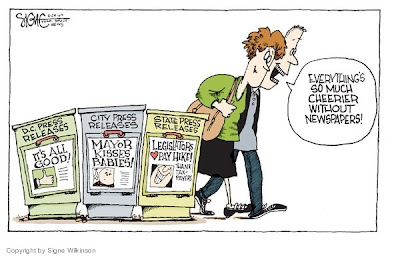 As long as newspapers are running poitical cartoons like this, they're going to keep going out of business. This beauty is from the SF Chronicle today but it ran in the Philadelphi Daily News earlier in the week. Don't they know that we get our news from different filters now? That most of us want to read it online instead of on paper? Why are they letting their businesses get flushed down the toilet because of their unwillingness to move off of paper? Monopolies die hard. P.S. I took me 15 minutes to find this online, because the search engines on each newspaper site were so bad. I finely found it on an aggregator site.